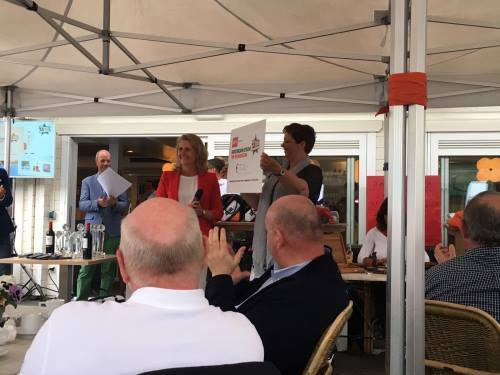 During the Nooteboom Transport Days and Open Day Nooteboom supported the Tim Foundation. After 3 amazing Days at our facility in Wijchen with more than 5000 visitors we are happy that we can congratulate the Tim Foundation with an excellent result of EUR 101,900.- and we are happy that we have contributed to achieve this. The Tim Foundation supports dr. Jan Smeitink at the Radboud UMC University in Nijmegen in his research to find a drug against the mitochondrial energy-sapping disorder ‘Leigh disease’. Also thanks to all our relations who have made a donation for this charity. Donations are still welcome: NL65 INGB 0676 2003 03 (ING bank) t.n.v. Stichting Tim Polderman Foundation. More information.